Bob: Okay, we’ve got this hockey team, and we have to make a logo for them. Any ideas? Lucy: What’s the team called? Lucy: How about a buffalo with some sabres? Bob: I like your thinking! Okay, so the Sabres don’t have the most creative, ingenuous or outside-the-box-thinking logo, but that’s not always a bad thing (just ask Gary Busey). If you’re a team based in a town called Buffalo, you’ve pretty much got a basis for a team logo right there, and some of the other Buffalo teams decided to just go with that, like the Buffalo Bills (named after the famed buffalo hunter,“Buffalo Bill” Cody, not to be confused with the target of John Lennon’s scorn, Bungalow Bill), or the very redundant Buffalo Bisons. According to my secret sources (aka Wikipedia), the Sabres’ organization wanted something different, so they crowdsourced the team name in a contest and came up with Sabres. No idea what a sabre has to do with a buffalo, or the city of Buffalo, but that’s what crowdsourcing gets you. So, how you mix these two relatively disparate elements into one logo? “You don’t,” said the logo designer. And in this case, I think it was the right choice. 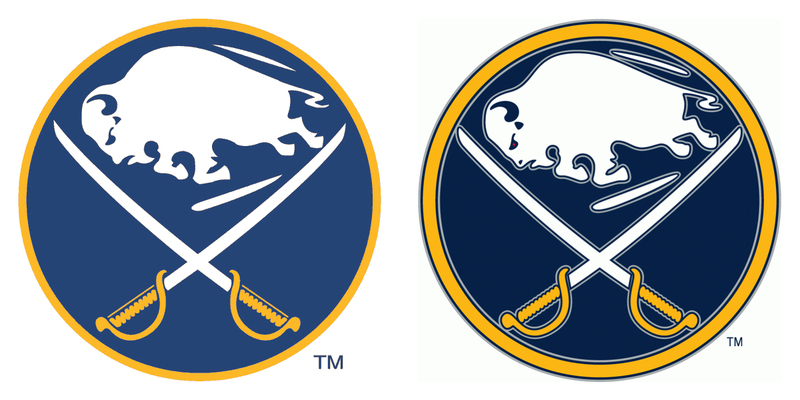 I’ve already talked extensively about the dangers of using animals in a professional sports logo, and they wisely steered clear of having a cartoon buffalo holding a sword in one hand and a hockey stick in the other. Really, how stupid would that look? The only thing worse would be something like a fabric crop, say cotton, dressed like a king and playing hockey. Good thing nobody did…oh, wait a minute. Anyway, they wisely left the two alone, and just put them together in a circle, neither interacting with each other or really aware of each other. The buffalo is just charging, as buffalos are wont to do (sometimes without much good sense) and the two sabres are just hanging out, like they’re mounted on the wall. The result is a quirky logo that’s well constructed and, as such, has a lot of character to it. It’s a good thing the buffalo and sabres didn’t switch positions, otherwise it could be misconstrued as a hamster wheel. The buffalo itself is a great example of using animals and animal caricatures in the design of hockey logos for a professional league. It’s simple and pared down to its core, but still has a lot of strength and dynamism to it. The only stupid thing is the red eye. Really, is this necessary? In most cases, the buffalo is too small to even notice the red eye and besides, how many buffaloes have you seen with red eyes? We get it, the buffalo’s angry. Gotcha. Good thing I have some handy-dandy red-eye removal technology. The other element, the sabres, are again simple, pared-down but still has some style and character to it thanks to the design of the handles. It really is well done. 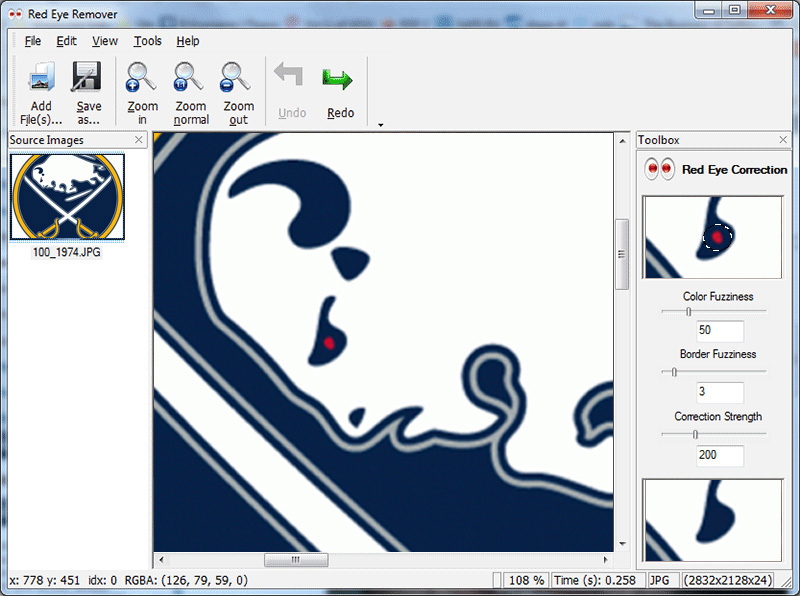 But I’d be remiss if I didn’t bring up the Sabres’ logo legacy. This vintage logo came back into full-time usage in 2010, after 14 years of general awfulness, including a flaming demonic buffalo that is the epitome of everything I dislike about animals in logo design and bad ’90s-era “xtreme” design. It’s a complete mess and would have been very low on this BTLNHL list had it still been around. The only thing that could have been worse is a buffalo that looks like a slug, and that’s exactly what came next. Really? Seriously? Luckily for Buffalo fans everywhere, they went back to their original branding after realizing how good it looked after the inaugural Winter Classic. The only hangover from those 14 years of darkness is the red-eye, which is kind of like Steve Zissou’s crazy-eye. So, this heritage logo is a vast improvement over the previous logos. But the new version isn’t exactly the same as the original. The blue is a little bit darker, which I like (as it has more strength and contrast against the white ice) and they added a grey outline around everything, which I don’t like at all, because adding the grey didn’t create just one outline, but two, with another outline of the darker blue around everything as well. Is that really necessary? Having just a grey outline (instead of a grey and blue outline) looks awful, so how about no outline at all, except around the outside of the logo? I think it’s much better. The outlines just detract from the beauty of the elements inside the circle. Speaking of the circle, it’s always a simple and great choice to get elements together into a cohesive logo. It doesn’t always work, but in this case, it does well. So, we’re deep into the top half of the countdown now, with the quirky but well-executed Buffalo Sabres coming in at #14. Hm, I don’t disagree with any of this analysis, and I know you work hard on these, but it feels like something is missing. Maybe I want to hear more about the details of the logo, and not just the overall theme? Like, what do you think of the, erm, “motion lines” above and below the buffalo? What about the simplification of the handles of the swords, in the current logo compared to the original? I did actually consider saying something about the motion lines, and I played around with them in Photoshop, deleting them, adjusting them, etc. but honestly, I couldn’t decide what I liked best. The lines add to the movement of the buffalo for sure, but they add clutter to to the overall design. In the end, it seemed to be a wash, so I didn’t bother to bring it up. I could take it or leave it. For the sabre handle, the change is pretty minimal, but I like the simplification (as I seem wont to do). It’s a good touch. First off, I have LOVED reading this blog since I stumbled on it and, save for a few logos, I generally completely agree with your rankings. 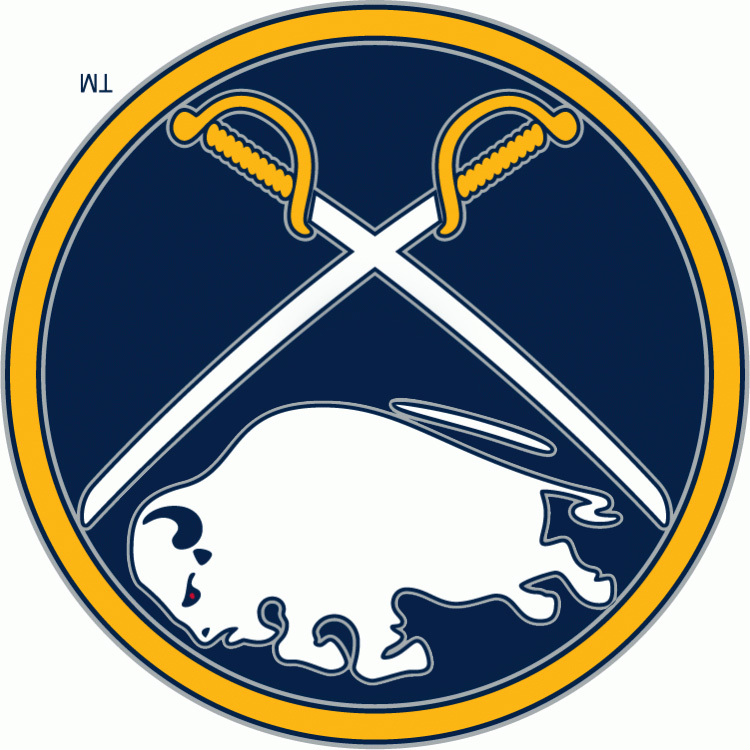 As a Sabres fan, I kept thinking about where this logo would land, and this seems about right. The solution to solve the awful grey outline problem you put forth is spot on. Can’t wait to see how you stack the top 5 or so logos… it would be a challenge for me. It’s a challenge for me too! It feels like it’s going to get trickier from here on in. Most people can agree on things they don’t like, but agreeing on things they do like is a bit harder. Wish me luck! And thanks for the additional info! just an fyi, the buffalo’s red eye has been around since before the flaming goat head appeared. it seems to come in and out of use from the beginning pretty much. I agree with the gray piping, its use on the jersey is even worse than in the logo. completely unnecessary, in my opinion. 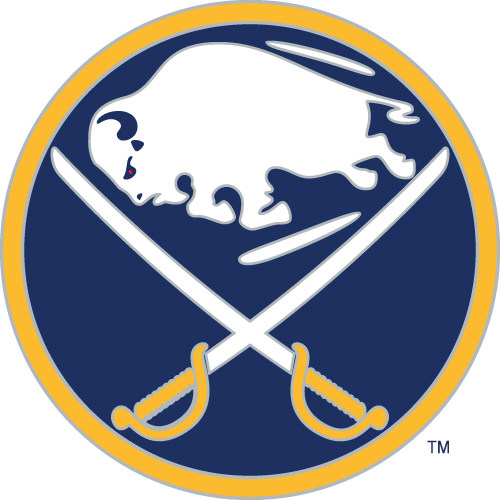 lastly, as a sabres fan i will say that their logo deserves to at least be ahead of the canucks, based solely on it making more sense for a buffalo to appear in a buffalo team’s logo than an orca to appear in a vancouver team’s logo and the flames logo is just sort of …. uninspiring i guess. but it’s ok, i get it, you’re probably canadian and buffalo is only on canada’s waiting list. Agree re: Orca, not at all re: Flames. The Flames logo is simple and shows great continuity with the team’s time in Atlanta. Too few relocated teams do that. The orca makes a lot of sense for Vancouver. I’ll explain why when they take their place in the countdown. I’m a graphic design student as well a huge fan of your site, and an even bigger Sabres fan. As a confessed lover of typography and lettering, I’m very surprised you didn’t at all bring up Buffalo’s 40-year anniversary 3rd jersey design and specifically the logotype. Love to know what you think of it! Cool, thanks, glad you like the site! It’s much appreciated. I’m trying to stick primarily only to the main team logo (and not mentioning much on jerseys and/or alternate logos) at this point, but I’m definitely wanting to write more about those things later on. Stay tuned! I was interested to see if you were going to bring up the Muslim Brotherhood symbol. I’ve always kind of wondered if maybe it was inspired by that to some degree, but maybe it’s just me. My guess is the similarities between the logos are purely a coincidence. Just stumbled upon this. Couldn’t agree more on the outline. It took a pretty cool logo and just made it blurry. I don’t know if non-designers notice it, but the first time I saw it I thought I needed new contacts. Tiny thin lines never look good on sports logos. I guess the designer was like, “We can’t just use the old one as-is. We need to improve it. Got it! An extra outline!” I don’t get it. Yeah, outlines are unfortunately too common in sports. The Sharks logo (old and new) is a strong offender as well, but there’s tons of them out there. 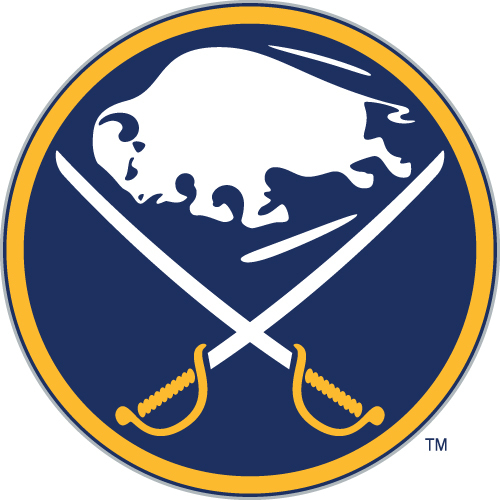 Not sure if it’s been mentioned already, haven’t read through every comment but the White Buffalo with the red eye is a Native American belief, prosperity or good luck, that’s why the Sabres logo has a red eye. Thanks Mike, had no idea. Now it actually makes sense, but it’s still a strange inclusion as there is nothing else in the logo to connect to Native American mythology or design style.